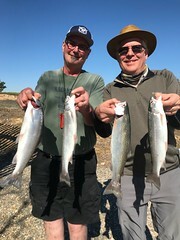 I had two great people on the 30th of December to catch some rainbow trout at Don Pedro. The day would be with light clouds and very little sun on the day. We launched at 8:00 A.M. and started fishing. The first spot we tried came up empty and also the second spot. 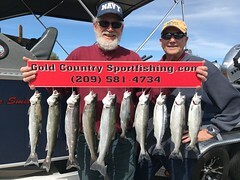 We picked up and headed to our third spot and that turned out to be the best spot of the day as we stayed almost the entire day catching and releasing many rainbows. The day was filled with lots of conversation and laughs. The day ended with the duo keeping eight trout and releasing many others and they had several missed strikes. 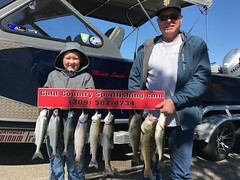 A great way to end the year fishing with two great people. Thanks again!